This couple will have you wishing for a wedding just like theirs! 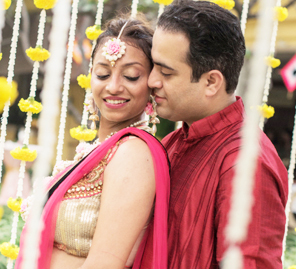 Swati and Priyal’s wedding in the Goa was an occasion marked by warmth love and joy. 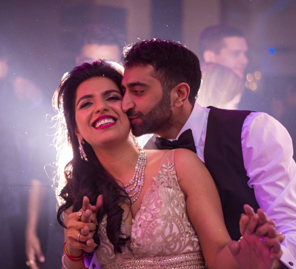 With all their close ones in attendance, the duo said 'I Do' and every precious moment was carefully preserved by WeddingSutra Favorite The Creative Lens. Though they were both born in South Africa, Priyal moved to New York at the age of 10. He only met Swati when they were introduced to each other on a trip to India by Priyal’s childhood friend. Little did they imagine that a mere 14 months later, they would be married. The meeting was enough to keep them keen on staying in touch over the phone even after returning to their home countries. They planned to meet again, five months later, in London. And they immediately knew they wanted to spend the rest of their lives together. Growing up, Swati had watched all the Bollywood movies. Years before meeting Priyal, she’d been disappointed at not being able to visit Dumbo, Brooklyn, a place she fell in love with on-screen in the film Kal Ho Na Ho. So she told Priyal that one day, she’d love to visit when she visited him. Despite the engagement planned for New York in November 2017 – Priyal was determined to stage a proposal that Swati had dreamed of. 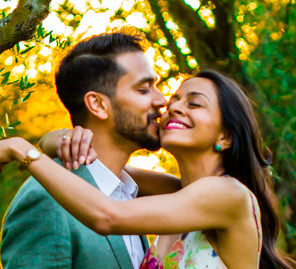 He planned a pre-engagement shoot and whisked Swati away to a surprise! She was thrilled when she landed in Dumbo, loved the views and was then beside herself when Priyal went down on one knee for the cameras. Priyal and Swati had independently dreamt of having an intimate destination wedding with close family and friends only. Pleased at being on the same page, they began scanning the globe; from Mauritius to the South African coast to Thailand and exotic locales. But it was India that they chose. They fell in love with the Goa Marriott Resort & Spa as soon as they saw it. Impressed on their first visit itself with the hospitality and services, the fact that the water was so close and would be a perfect wedding backdrop at sunset made this place a keeper. The fact that even the sales, events teams, chefs and housekeeping were all cooperative and helpful, just reassured them they’d made the right decision. “Our wedding was planned by Weddings N Dreams. Namita ensured that we got everything we dreamt of. She helped make our wedding stress free and let us enjoy the location with our family and friends. The duo’s mehndi was a poolside party with lots of food. The men swam and the women had their hands adorned with henna. The couple thought this was the best way for the two families to get to know each other and the plan worked. With lots of dance performances, games and good food the night was nothing but a big party. Both families burned up the dance floor into the wee hours. South African and American guests also learned a few garba steps from the groom and by the end of the night, despite the cultural differences, it just felt like they were all one big happy family! The bride wanted to keep it traditional as this was a pooja so she decided to use marigolds in the setup and with Weddings N Dreams by their side, she was able to turn her vision into reality. The colors for the wedding were peach, mint green and purple with touches of gold. The couple wanted something simple so that the setup would not take away from the lovely natural backdrop. While the groom arrived at the venue with his baraat, the bride chose to enter in a rickshaw with her brothers and father wearing a pastel outfit by Neeta Lulla. It was a perfect sunset setting for the spring wedding.